Explore the beautiful temples of Bagan at your own pace! A fantastic tour. Oo was an excellent guide, very informative and friendly. We are so glad we did this, we saw the most amazing places and learnt so much from Oo. We will definately recommend Klook to other people. It was a brilliant day. Thank you so much. If you're looking to explore a new destination at your own pace, then this guided e-bike tour is just perfect for you! 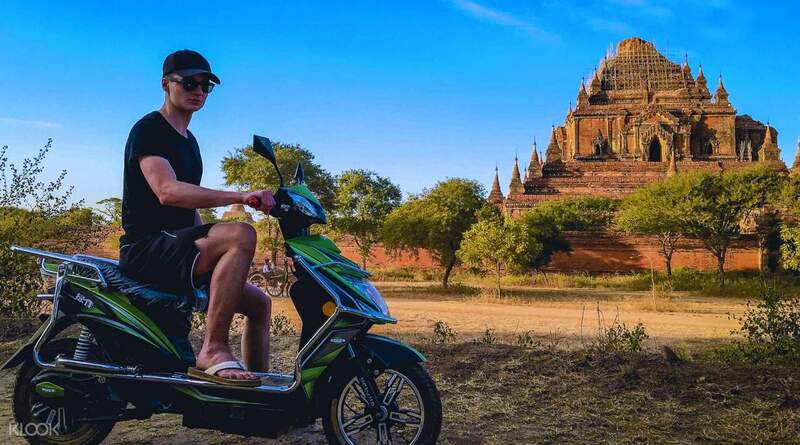 When you visit the temples of Bagan in this unique e-bike tour, you'll get to explore the beautiful cultural sites with your own guide at a completely leisurely pace. 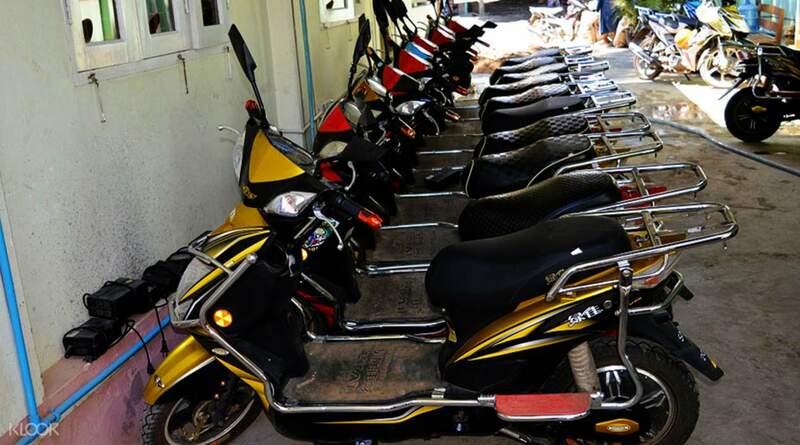 Your day starts off with a pick up right from your hotel ready to begin your e-bike adventure, followed by a ride on your bicycle to the Shwezigon Pagoda, which will show you how Myanmar's stupas were built. Check out the mural paintings inside the Wetkyi-In-Gubyaukgyi Temple, where Jataka scenes and stories from the Buddha cover the walls. Feel the full grandeur of Burmese culture at Htilominlo, one of the largest temples in Bagan. You'll lose yourself in the splendour of its fine plaster carvings over its arch pediments, frieze, and more! Your last stop for the day is Thatbyinnyu Temple, an asymmetrical cross-shaped temple built in the middle of the 12th century, before you get dropped off at your hotel full of your new knowledge about the ways of Bagan. A fantastic tour. Oo was an excellent guide, very informative and friendly. We are so glad we did this, we saw the most amazing places and learnt so much from Oo. We will definately recommend Klook to other people. It was a brilliant day. Thank you so much. A fantastic tour. Oo was an excellent guide, very informative and friendly. We are so glad we did this, we saw the most amazing places and learnt so much from Oo. We will definately recommend Klook to other people. It was a brilliant day. Thank you so much. Couldn't have asked for a better guide to take us around Bagan. Our guide, Oo, was fantastic and we learned so much from him not only about the temples we visited but also Myanmar in general, its history, and the people. Never used an ebike before and tried learning on the day itself. When I couldn't just get the hang of it, we ended up with me riding with Oo which he was fine with. We also ended up booking for 3 (the minimum) even if there was just 2 of us; cost made sense so it wasn't a biggie. Highly recommend this tour! It's personalized and we didn't feel rushed at all. The amount of time we spent was just right and it helped us get acquainted with the town. Wish I could get in touch with our guide again to thank him again for the great experience. This was one of the highlights of our trip, no doubt. Couldn't have asked for a better guide to take us around Bagan. Our guide, Oo, was fantastic and we learned so much from him not only about the temples we visited but also Myanmar in general, its history, and the people. Never used an ebike before and tried learning on the day itself. When I couldn't just get the hang of it, we ended up with me riding with Oo which he was fine with. We also ended up booking for 3 (the minimum) even if there was just 2 of us; cost made sense so it wasn't a biggie. Highly recommend this tour! It's personalized and we didn't feel rushed at all. The amount of time we spent was just right and it helped us get acquainted with the town. Wish I could get in touch with our guide again to thank him again for the great experience. This was one of the highlights of our trip, no doubt. Great way to explore old bagan and see majestic temples and stupas, get to ride an e-bike which is fun! Our tour guide Oo is very accomodating, knowledgable and nice. Great way to explore old bagan and see majestic temples and stupas, get to ride an e-bike which is fun! Our tour guide Oo is very accomodating, knowledgable and nice. Highly recommend this activity. It is a very fun and unique way to see the city. Our guide is great. Friendly, fun and had good knowledge about the city. We had a great time! Highly recommend this activity. It is a very fun and unique way to see the city. Our guide is great. Friendly, fun and had good knowledge about the city. We had a great time! Really fun to explore Bagan temples. Highly recommend this ebike tour. Really fun to explore Bagan temples. Highly recommend this ebike tour. The ebikes are a super cool way to explore the temples area! Our guide took us around and we visited a few of the main pagodas! The ebikes are a super cool way to explore the temples area! Our guide took us around and we visited a few of the main pagodas! Great tour. Such a cool way to see the city of Bagan on a e-bike! Great tour. Such a cool way to see the city of Bagan on a e-bike! Exciting! The guide is very nice! Exciting! The guide is very nice!